LEAF Open Farm Sunday is the Great British Farm Day! It gives you the opportunity to welcome the public onto your farm and show them what farming is all about, so that visitors can fully appreciate and value the work you do. It was set up in 2006 and continues to be managed by LEAF (Linking Environment And Farming). Every farm has a story to tell – your work on the farm, the crops you grow and what they are used for, the seasonality of produce, the journey of your product from farm to fork (or however it impacts on our lives eg. fuel), your farm machinery, how you manage your soil, water and habitats for wildlife, the history of your farm. Your visitors will be fascinated to learn about the everyday activities you do on the farm. Why would I take part? Research shows that getting people out onto a farm to meet a farmer and see real farming up close has a huge positive impact: changing people’s attitudes to buying more British produced food; building community relations; educating the public, raising the profile of your farm and the whole farming industry. Now, more than ever, farmers need to gain public support for the vital work you do and LEAF Open Farm Sunday provides the ideal platform to do just this. 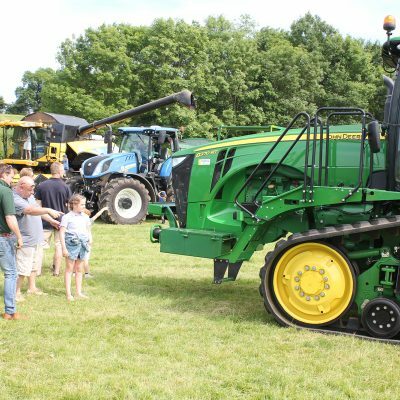 Join hundreds of farmers across Britain and take part in the farming industry’s annual open day. This website has lots of information to help you start thinking about organising an event for LEAF Open Farm Sunday. Make sure you register your event then you will receive the Open Farm Sunday Handbook packed with lots of hints and tips to help you organise an event. Interested, but not ready to register yet? If you’re keen to host an event, but you’re not ready to register yet, sign up to our mailing list at the foot of this page and we’ll keep you up to date with our plans, and give you an occasional nudge to help you get started! Last year 88 farmers hosted their first LEAF Open Farm Sunday event and enjoyed the experience. If you have any questions or want to speak with an experienced host farmer please get in touch with LEAF: 024 7641 3911 openfarmsunday@leafuk.org. When you’re ready, please register your event here.